A team at Stanford University in the United States is working on the world's largest digital camera, designed to photograph faint astronomical objects. 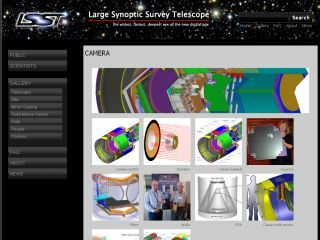 The camera, which is being built by the Stanford Linear Accelerator Center for the Large Synoptic Survey Telescope (LSST), a large aperture telescope which photographs space from its a Chilean mountain. Astronomical phenomena, including dark energy, dark matter and near-Earth asteroids will be investigated by the LSST, as well as acting as inventory for the solar system. The mirror on board the telescope will be 8.4 metres in diameter, and will be able to scan large areas of the sky while generating 3D maps using 800 15 second exposures per session. The camera itself is expected to be roughly the same size as a small car. Other specs of the onboard camera include 189 CCD ultraviolet, visible and infrared light-sensitive sensors which will produce 3.2 gigapixel images. The estimated cost of the camera is $170m - perhaps not one for the Christmas list then. The telescope itself will have the power to resolve a pair of car headlinghts from a distance of 400 miles.